Heat oven to 425°F. Line 2 cookie sheets with foil. Brush tortilla triangles with 2 tablespoons of the oil; place in single layer on cookie sheets. Bake about 10 minutes, turning over twice, just until triangles begin to crisp; set aside. In 12-inch nonstick skillet, heat remaining oil over medium-high heat. Cook tomatillos, onion, chile and garlic 5 to 7 minutes, stirring frequently, until tomatillos and chile blacken and blister and onion and garlic are tender. In blender, place tomatillo mixture and all remaining Tomatillo Sauce ingredients. Cover; blend about 30 seconds on medium speed or until smooth, stopping to scrape down sides if necessary. Into same skillet, pour Tomatillo Sauce; cook over medium-high heat 10 minutes, stirring frequently. Reduce oven temperature to 375°F. Spray 8-inch square (2-quart) baking dish with cooking spray. Arrange half the triangles in baking dish (do not overlap). Top triangles by layering with half of the chicken and cheese Fillings ingredients; pour half of the Tomatillo Sauce over cheese. 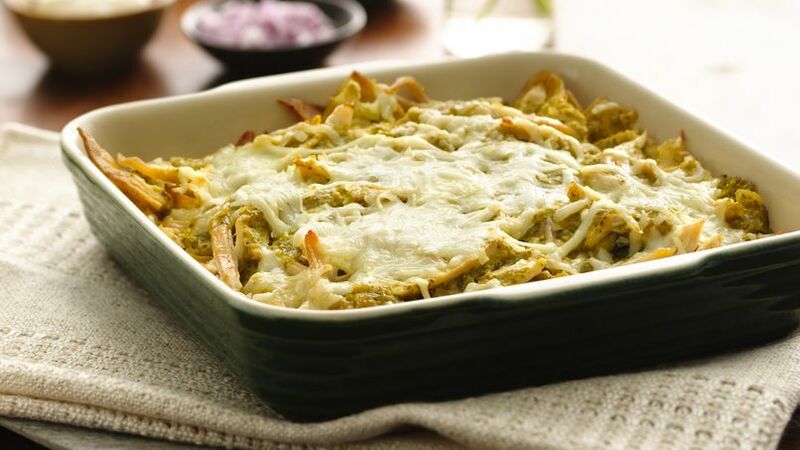 Repeat layering with remaining triangles, chicken and Tomatillo Sauce; sprinkle with remaining cheese. Bake 3 to 5 minutes or until cheese is melted. Serve with Toppings ingredients. Progresso® chicken broth provides a simple addition to a chilaquiles made with corn tortillas, tomatillos and chicken – a delicious Mexican side dish.